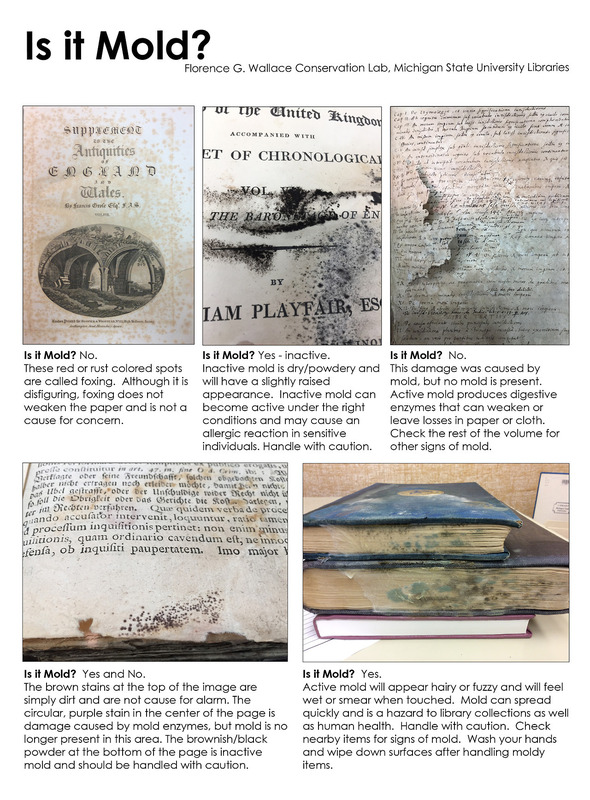 One of the hazards in collecting and/or selling antiquarian and secondhand books is the frequent presence of mold. Active book mold is usually identifiable, as it is typically damp and fuzzy, but inactive mold can often be confused with dirt, staining, or just commonplace foxing. I recently found the very helpful chart below, which was designed to help bibliophiles and librarians to identify signs of mold. A big h/t to the Michigan State University Library for sharing. This entry was posted in Books, Libraries, Tech and tagged Antiquarian Books, Book collecting, book selling, secondhand books. Bookmark the permalink.